Ham hock is the lower part of a hog’s leg and includes the meat, bone, tissue and fat. Ham hock is typically cut into 3-inch pieces and smoked. Ham hock isn't usually served as an entree, but is often added to bean dishes, vegetables, and stews to impart a smoky, salty flavor. The ham hock is either left in the dish or removed after it has imparted flavor. When considering a substitute for ham hock in a recipe, choose an item that is equally strong in salty and smoky flavor. Smoked turkey imparts a smoky, meaty flavor to food that's similar to ham hock. Use wings, drumsticks or neck bones as a substitute. Use equal parts of smoked turkey to ham hock when substituting. Add the smoked turkey in the same method that the recipe states for the ham hock. In general, using smoked turkey instead of ham hock will result in a flavor that's slightly less salty. If you find the flavor lacking, add table salt or kosher salt to taste. Meat stock can create a similar flavor to ham hock in a dish. Meat stock works best for dishes that call for the cook to remove the ham hock before serving. To substitute meat stock for ham hock, replace the water in the recipe with the meat stock. Because the meat stock is preseasoned, it tastes similar to water used to cook ham stock. Use equal parts stock to water for equal flavor. If you have high blood pressure or are on a low sodium diet, choose a stock that is labeled low sodium. Substitute any other form of pork for ham hock and it will impart a similar flavor. 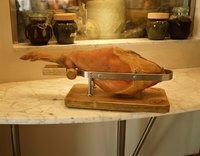 Salt pork, bacon, guanciale, cubed ham or even a ham bone can be used in the place of ham hock. For all of these ingredients, substitute pound for pound with ham hock, with the exception of salt pork. For salt pork, use a 1 to 2 ratio of salt pork to ham hock. For vegan and vegetarian recipes, smoked salt is an effective way to capture the smoky, savory flavor of ham without incorporating any meat. Smoked salt is comprised of sea salt and smoke volatiles. To substitute smoked salt for ham hock, add one tablespoon of smoked salt for every pound of hock that the recipe calls for. To make your own smoked salt, smoke the sea salt in a wood cooker or coat the salt with liquid smoke. My Recipes: What is Ham Hock?